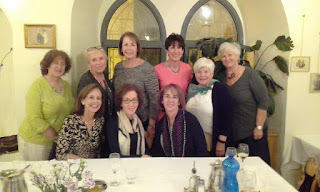 The Hadassah Foundation began its "pre-mission" to Israel this evening with a lovely dinner in Jerusalem. (Pictured above: Highly-sated Board members!) Over the next few days, we will engage in some touring and a celebration of Shabbat, before begining the heart of our work on Sunday: visiting our grantees.